If you think that you are going into labor, then your contraction count can help the doctor in determining whether or not you should go to the hospital for delivery. A clock or stopwatch can keep track of the contractions frequency and duration, but it may not be precise. Therefore, a reliable tool is designed to assist moms-to-be to calculate their contractions. MomJunction provides the contraction timer, a tool that automatically records contractions for you. You can even download and print your count and share it with your doctor, friends, or family. How to use the contraction calculator? • Click the "Start counting" button when you feel a tightening sensation (you can either feel it from inside or with your hand on the belly). This is the beginning of one contraction. • Click the "Stop counting" button when you feel the relaxation of the uterus. • Repeat the same as the contractions continue, to check the interval of the contractions. 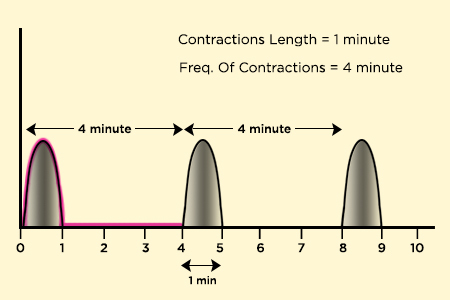 At least six to eight readings are required to know the pattern of contractions that includes duration (length of contraction) and frequency (how far apart the contractions are). Labor contractions are periodic tightening and relaxing of uterine muscles, which are stimulated by the oxytocin hormone released by the pituitary gland. They begin as cramps in the back and move along the abdomen in a wave-like manner. The abdomen becomes very hard. The contractions tighten and thicken the upper part of the uterus (fundus) while stretching and relaxing the lower portion and cervix. These series of contractions help the baby pass through the birth canal. It could be difficult to differentiate between true labor contractions and false contractions, also known as Braxton Hicks contractions, which occur in the weeks nearing childbirth. These false contractions are regular and vary in intensity. Some women actually feel they are going into labor due to these contractions (1). However, the important distinguishing factor is progression. Unlike false contractions, true contractions get stronger, longer, and closer with time. Except for some contractions that occur before the water breaking, you can be sure you are having labor contractions. You can even measure them easily with a calculator, instead of a clock or watch, to check how far you are into your labor. • This pattern remains for at least two hours (2). Here is when your active labor starts where you can no longer hold a conversation or relax completely, and can go into labor. What are preterm labor contractions? If you begin to have regular contractions that result in cervical changes before 37 weeks of pregnancy, they are known to be preterm contractions. Changes in the cervix include both effacement and dilation that send you into preterm labor (3). Q. How do Braxton hicks differ from true contractions? True contractions begin atthe back and spread towards abdomen. Braxton Hicks are only in the belly and can cause hardening in a part of the belly. They are mostly not painful. You will get around four to five contractions at a time and then they disappear. True contractions, however, get stronger, closer, and more painful with time (4). Braxton Hicks, also known as false labor, prepares the body for the work that lies ahead. These contractions are irregular and short, and are not very painful. The Braxton Hicks Contractions begin in the 5th or 7th month and go on until delivery. Q. What does it feel like when I go into labor? Going into labor is like period pains, with pain ranging from mild to severe. It differs in every woman. You will have a backache, or cramps, or both. Or you will also feel heaviness or ache in the lower part of the tummy. Braxton Hicks is usually felt in the front and groin area. It can also originate in the back, but never moves to the front. Q. Based On Contractions, How Can I Tell I Am In Labor? You must give your doctor the details of your contraction, and whether or not your contractions are getting longer and coming closer together. Note: Do not start at the middle or end of a contraction. If you’ve missed the first, wait for the next contraction to begin. The information provided by our Contraction Timer should not be considered as a substitute for medical advice given by your physician. If you have any queries or doubts, contact your healthcare provider right away!